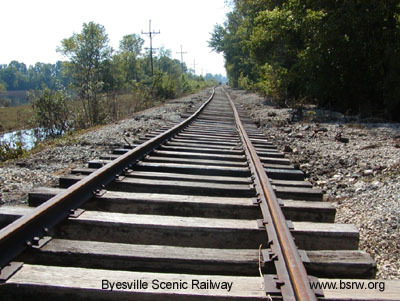 In September of 2004, the route of the Byesville Scenic Railway suffered extensive damage due to massive flooding. About eight inches of rain fell in a 48 hour period as the remnants of Hurricane Frances moved north through Ohio. The rain started falling Wednesday Sept. 8th and continued heavily and steadily through Thursday Sept. 9th. As the floodwaters crested on Friday Sept. 10th, Wills creek overflowed its banks. Soon the water was completely covering the rail line from the south end of Byesville all the way south to Derwent, except for a short stretch near the Seneca Lane crossing. 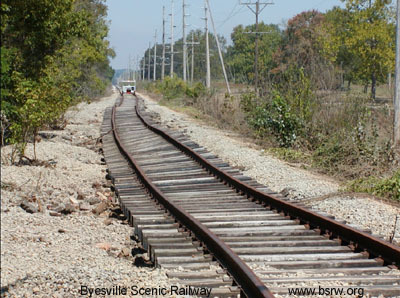 The railroad right-of-way south of Byesville was built approximately 5-10 feet above the surrounding countryside. Because of the elevation, the roadbed was acting as an earthen dam as the flood waters rose and fell. The flood waters were exerting great pressures on the right-of-way, and the force of the water was proving to be too great. 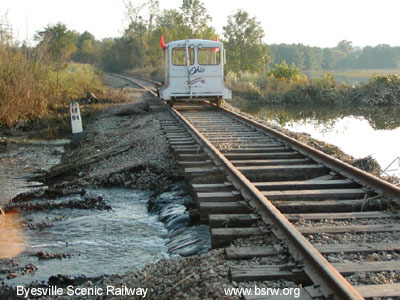 All along the line, the water began bursting through the roadbed and many yards of ballast and under-bedding were being washed completely away from under the rails and ties. 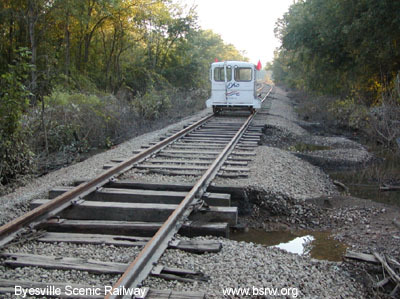 As the flood waters receded, it was evident that the railroad had suffered extensive damage to its right-of-way. Over 140 washouts were discovered between Byesville and Derwent. Some of the washouts were as much 15-20 feet long and 4-5 feet deep below the rail. Many ties were swept away with the flood water never to be seen again. 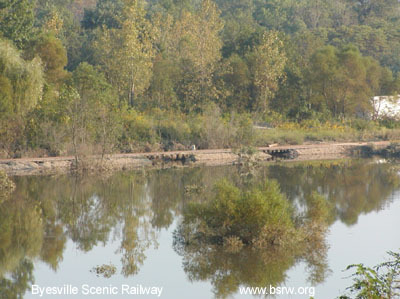 Because our railroad parallels and crosses Wills Creek several times south of Byesville, the track was washed out from east to west in some areas, and from west to east in others. The worst damage was just north of No. 4 bridge, north of Derwent. 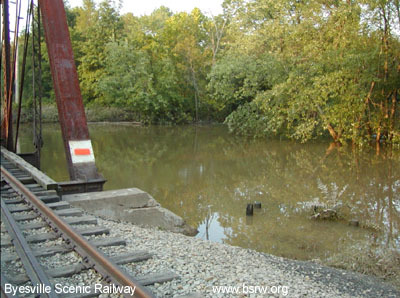 Here, the flood waters completely washed the roadbed out from under the track for a distance of over 400 feet and up to a depth of 4 feet. 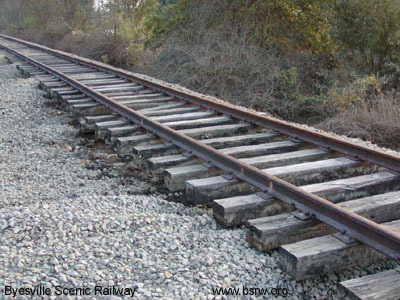 The tracks were suspended in the air, and shifted out of alignment by 10 feet. 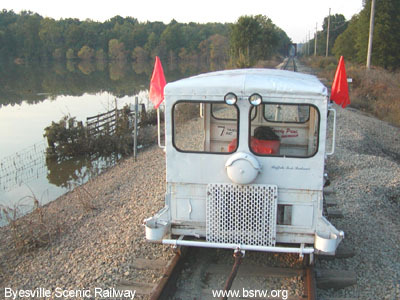 Fortunately none the continuously-welded rail broke despite the great force of the water. 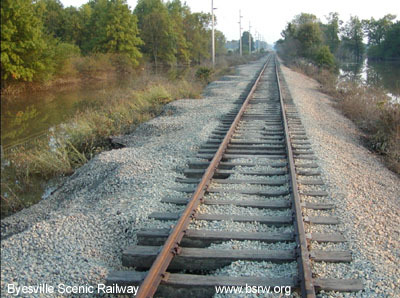 It was estimated that 700 cubic yards (or 1,000 tons) of fill & ballast would be needed to repair the line. At the time, there was much uncertainty as to exactly when and how the rail line between Byesville and Derwent would be repaired. The railroad had just been repaired in 2002 from another recent flood- The "Flood of the Century" in June of 1998, and would have to be repaired again. 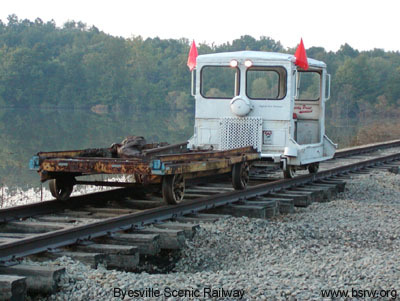 Fortunately, local leaders stepped up and secured monies for rebuilding the line. 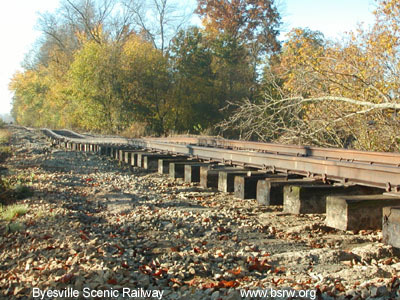 Rebuilding of the line began in February of 2005, and was complete the following May, just in time for the 2005 excursion season. For photos of the rebuilding efforts click here. Southbound view of washouts and flood waters at Milepost 52. Flood waters are still flowing under the right of way. View of flood waters at No. 5 Bridge. View of washouts south of No. 5 Bridge. The track was completely under water in this area. View of flood waters south of No. 5 Bridge. One of the many washouts resulting from the flood. Another view of washouts and flood waters, south of No. 5 Bridge. Northbound view of "the big washout" located between Seneca Lane and Derwent Sunday 9/12/04. "The big washout" was over 400 feet long and more than four feet deep in places. 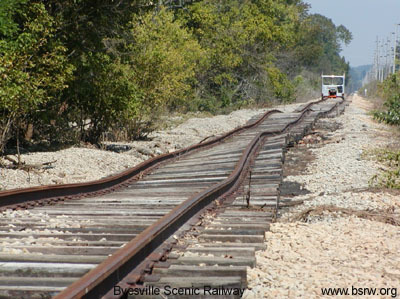 The tracks were suspended in the air, and shifted out of alignment to the west by 10 feet. Southbound view of the big washout, No. 4 bridge is in the distance. View of the tracks suspended in the air at the big washout.